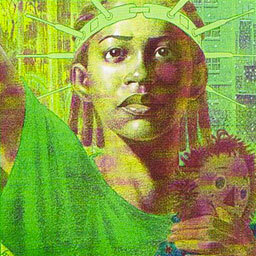 Frank Miller and Dave Gibbons’ brilliant Give Me Liberty features a surreal America in the near future that is falling apart. Their Martha Washington, a young black woman raised in a housing project, is a tough, resourceful, heartbreaking heroine who journeys through and ultimately survives this America. Koom and Kumar reflect upon the neglected classic and its eerie ability to touch upon the spirit of America during this election season. They recorded this podcast after the third presidential debate, when Hilary Clinton seemed likely to win, and joked about the connections. Sometimes, reality has a way of outdoing fiction. This entry was posted in Deconstructing Comics and tagged Dark Horse, dark horse comics, dave gibbons, frank miller by TimDC. Bookmark the permalink.